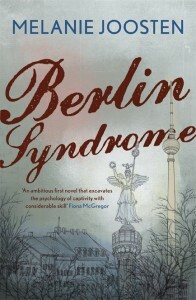 Berlin Syndrome, Joosten’s haunting debut novel. «Small-town Australia in the 1950s. I grew up knowing my parents came from a place called Poland. About Poland itself Iknew very little, ignorance that remained unchanged until I was an adult. From early on, I knew Poland was ‘‘behind the Iron Curtain’’, which I actually conceived of as just that: one long curtain made of iron stretching right down from Gdansk to Trieste. (That’s a lot of curtain hooks, I know). Couldn’t get in. Couldn’t get out. Not the people; nor information about them. If I wondered at all about Poland, I came up with blanks every time. Truth is I didn’t know what I didn’t know until much later. Yet I’ve always had a strange sense of emptiness, of a prison without walls, of a sameness and greyness, a place of silence and stillness, of unkempt cemeteries, of places overgrown, a barren landscape locked out of time. I’ve never lost that sense, nor sought to disconfirm it. And within a few pages of starting Berlin Syndrome, it was with me again. Melanie Joosten’s haunting debut novel is set in 2006 in the east of the once-divided German city. Pretty quickly you pick up on the ambience – the peculiar character of life in an ex-Soviet satellite. The Russians are gone. The wall is down, sold off in thousands of fragments. But a frisson of the old Iron Curtain remains…». Review – Ruth Wajnryb – The Sydney Morning Herald – September 24th, 2011.